"Novel request" to find new homes for starfish and sea cucumbers as plans for 252-berth upgrade rubber-stamped. 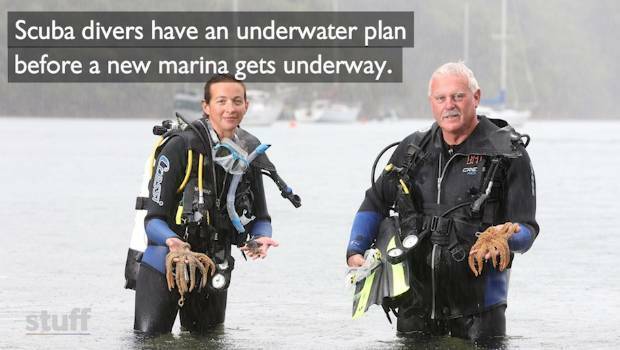 Marlborough scuba divers on the doorstep of a marina development want to move some of the often overlooked rock dwellers before construction starts. 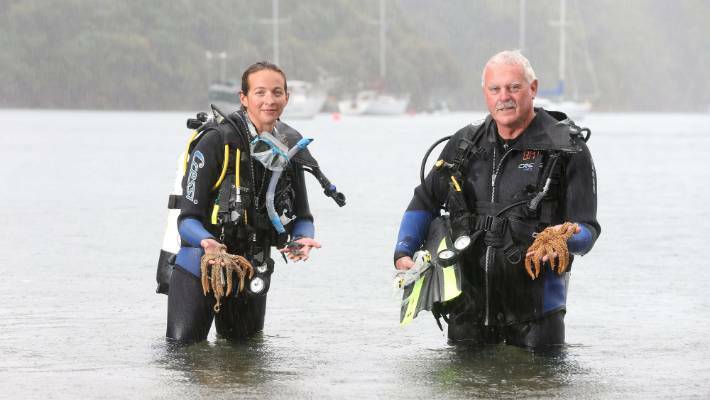 Local divers who regularly run dive lessons at the north western point of Waikawa Marina have come across seahorses, stingrays, starfish, sea cucumbers and fanworms, where the $20 million development will be built. Waikawa Dive Centre owner Stuart Scaife says they are "all for progress" and the extra 252 berths will be good for Picton, but it needs to be good for the environment as well. 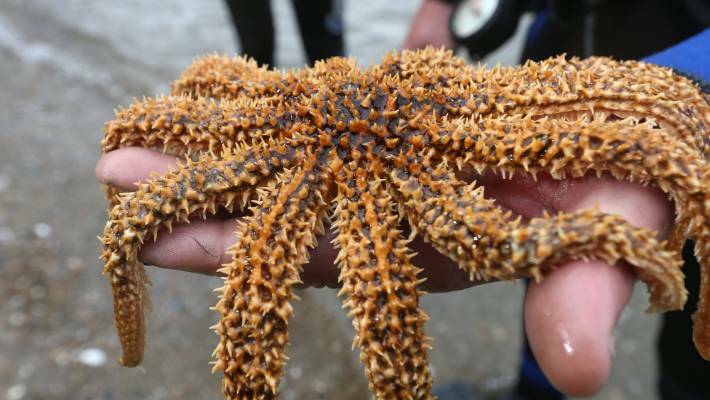 Divers around Waikawa Bay often come across a lot of starfish. An impact assessment of the marine area was conducted in order to gain resource consent. 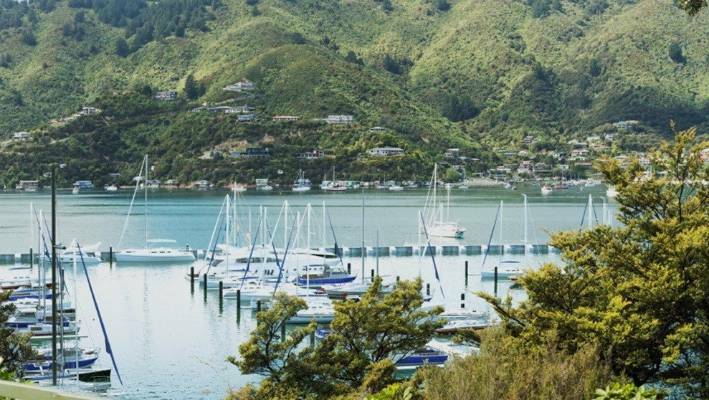 The report said the planned extension to Waikawa Marina would not have "significant adverse impacts" on marine ecology of Waikawa Bay or the wider Queen Charlotte Sound. But Scaife was worried the "life that exists beneath" could be lost. Kate Trayling and Stuart Scaife are worried starfish will be impacted by the marina development. "As a non-diver, most people just see the sea out there, and what's above it. "Obviously the fish life you can't move, but it's the animals, the marine life that is attached to the rocks. A starfish isn't going to outrun a bulldozer." Scaife conceded moving the marine life would not change the ecology of Waikawa Bay. 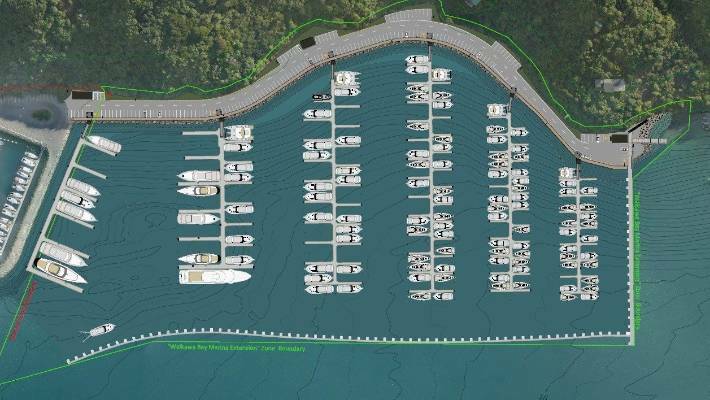 The extension will add 252 berths to Waikawa marina, further along the Snout. "But we'd like to take it out of one area and improve another. "Until we actually get down there and start moving stuff, I have know idea what the volumes will be, how much we can move. "I imagine it won't just be one dive, I imagine it will be spread over several weekends." Waikawa Dive Shop manager Kate Trayling, left, and owner Stuart Scaife want to move sea creatures before construction starts. Port Marlborough chief executive Rhys Welbourn said he liked the idea of moving marine life from the construction zone, but couldn't say if it would go ahead. "It's quite early, so I can't say 'yes' or 'no' to what we're going to do." Dives to assess marine life and seabeds for the resource consent showed "very little life in terms of specific species" in that area, Welbourn said. An artist's impression of the Waikawa Marina extension viewed from the properties on the Snout. "That's not to say that doing something like [the dive] wouldn't be a bad idea." They had put together a "comprehensive suite of plans" to protect the environment, he said. "Ultimately this is an opportunity for us to show during a major development, that we're going to do it the right way." 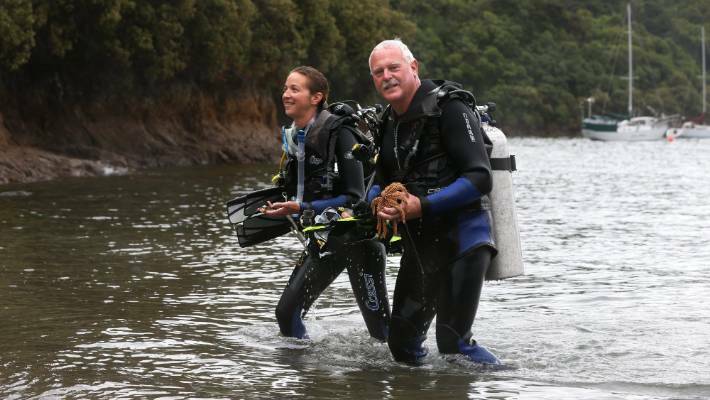 Marlborough District Council coastal scientist Oliver Wade said he thought the divers would be able to relocate the marine life without a resource consent. "It's quite a novel request," he said. "The only concern from me would be biosecurity matters, depending on where they're proposing to move things to."